Leningrad was surrounded by German forces and the siege was not lifted for two and a half years, by which time some three quarters of a million Leningraders had died of starvation. Most who have seen this, one of the most famous WWII photographs in history, have wanted to know more about the nurse and sailor. The whole truth behind the celebrated picture has finally been revealed. CBI - China: Day 38 of 41 of the 1st Battle of Shanghai, Manchuria. Germany:The Nazi Party receives 44% of the popular vote in Germany's last free election until 1939. CBI - China: Day 64 of 142 of the 1st Battle of Hebei. The Chinese 620th and 621st Regiments ambush the Japanese slowing down their advance, but they fail to stop it. UK: British aircraft manufacturer Supermarine's prototype Type 300 aircraft takes its first flight from Eastleigh airfield in England. It will later be named the Spitfire. The Supermarine Spitfire was a British single-seat fighter aircraft used by the Royal Air Force and many other Allied countries. The Spitfire was built in many variants, using several wing configurations, and was produced in greater numbers than any other British aircraft, 20,351 to be exact. It was also the only British fighter to be in continuous production throughout the war. The "Spit" was designed as a short-range, high-performance interceptor aircraft. Its distinctive elliptical wing had the thinnest possible cross-section, enabling it to have a higher top speed than several contemporary fighters, including the Hawker Hurricane. 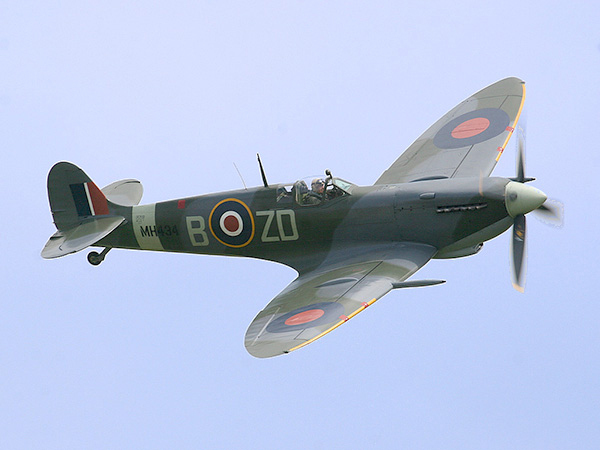 During the Battle of Britain, the Spitfire was perceived by the public to be the RAF fighter, though the more numerous Hawker Hurricane shouldered a greater proportion of the burden against the Luftwaffe. However, because of its higher performance, Spitfire units had a lower attrition rate and a higher victory-to-loss ratio than those flying Hurricanes. After the Battle of Britain, the Spitfire superseded the Hurricane to become the backbone of RAF Fighter Command, and saw action in all theaters of operation. It was much loved by its pilots. Although the original airframe was designed to be powered by a Rolls-Royce Merlin engine producing 1,030 hp (768 kW), it was strong enough and adaptable enough to use increasingly powerful Merlin and, in later marks, Rolls-Royce Griffon engines producing up to 2,340 hp (1,745 kW); as a consequence of this the Spitfire's performance and capabilities improved, sometimes dramatically, over the course of its life. The Spitfire continues to be a very popular aircraft, with some 53 airworthy Spitfires remaining worldwide. Germany: The Confessing Church issues a declaration rejecting Nazi ambitions to be "the supreme and ultimate authority in all spheres of life." About 700 Pastors are subsequently arrested. Spain: Day 232 of 985 of the Spanish Civil War. Spain: Day 597 of 985 of the Spanish Civil War. CBI - China: Day 242 of 2,987 of the 2nd Sino-Japanese War. Day 27 of 124 of the Battle of Henan. Spain: Day 962 of 985 of the Spanish Civil War. CBI - China: Day 607 of 2,987 of the 2nd Sino-Japanese War. Atlantic: A German U-boat torpedoes and sinks the Dutch steamer GRUTTO 20 miles off Belgium, killing all 18 aboard. Russian Front: The Soviet Politburo declares all Polish officers in captivity as "enemies of the Soviet Union" and sentences them to death. Finland: Day 97 of 105 of the Russo-Finnish War. Despite their heavy casualties, Soviet troops capture more islands in Viipuri Bay, Finland (Baltic Sea). MTO - Italy: An Italian collier ship is seized by the Allies. CBI - China: Day 973 of 2,987 of the 2nd Sino-Japanese War. Day 112 of 381 of the Battle of South Guangxi. Day 38 of 67 of the Battle of Wuyuan. Atlantic: A German U-boat sinks the Swedish ship MURJEK, which had been broadcasting its neutral status continuously, with 5 torpedoes 200 miles south of Iceland. No survivors. ETO - UK: Day 181 of 258 of the Blitz. Austria: Hermann Goering meets with General Antonescu in Vienna to demand Romanian participation in the upcoming German invasion of the Soviet Union. Bulgaria: The UK breaks off their diplomatic relations with Bulgaria. MTO - Greece: The first British reinforcements from North Africa arrive in Greece. MTO - Italy: The British submarine HMS TRIUMPH sinks the Italian ships MAZZAMEMI and COLOMBO LO FARO 20 miles east of Catania, Sicily. East Africa: Day 269 of 537 of Italy's East African campaign in the lands south of Egypt. East Africa - Eritrea: Day 29 of 56 of the Battle of Keren. PTO: Hitler orders his Foreign Ministry to try to draw Japan into the war by attacking British possessions in Asia. But this idea is rejected in order to keep the United States out of the war. CBI - China: Day 1,338 of 2,987 of the 2nd Sino-Japanese War. CBI - Thailand: Day 156 of 221 of the Franco-Thai War (Vichy France vs Thailand). USA: Navy Admiral Ernest King says to President Franklin Roosevelt, "We cannot in honor let Australia and New Zealand down." USA: US 1st Air Force: The Civil Air Patrol (CAP) begins flying ASW patrols off the east coast. Atlantic: Day 51 of 169 of Germany's Second "Happy Time," during which U-boats sink 609 Allied ships with little risk. The German battleship TIRPITZ, escorted by destroyers, departs for the Arctic Ocean to intercept Allied convoys in Operation SPORTPALAST. UK: Conscription (draft) in Britain is extended to include men between the age of 41 and 45. Russian Front - North: Day 179 of 872 of the Siege of Leningrad. Russian Front - North: Day 26 of 102 of the Battle of the Demyansk Pocket, another failed attempt to break the siege at Leningrad. Russian Front - North: Day 42 of 103 of the Battle of the Kholm Pocket. Another attempt to break the siege at Leningrad. Russian Front - Center: Day 57 of 103 of the Battle of Vyazma, Russia. Russian Front - Center: Day 57 of 103 of the Battle of Sychevsk, Russia. Russian Front - Center: Day 3 of 49 of the Battle of Rzhev, Russia, a diversion to pull more German troops away from Moscow. Russian Front - South: Day 127 of 248 of the Siege of Sevastopol, Crimean Peninsula. All German attacks against Sevastopol are shut down for the winter. CBI - Burma: Day 82 of 164 of Japan's Invasion of Burma. CBI - Burma: Day 3 of 5 of the Battle of Pegu. British troops keep fending off the Japanese attack. At Rangoon, the UK begins withdrawing to the Irrawaddy Valley. CBI - China: Day 1,703 of 2,987 of the 2nd Sino-Japanese War. Day 72 of 99 of the 3rd Battle of Changsha. CBI - Java: Day 6 of 13 of the Battle of Java. PTO - Borneo: Day 80 of 107 of the Battle of Borneo. PTO - Malaya: Day 15 of 357 of the Battle of Timor Island. PTO - Philippines: Day 88 of 152 of the 1st Battle of the Philippines. 5th Air Force provides air support. ETO: RAF bombers attack the Krupp manufacturing plant at Essen, Germany. This was the first attack on this industrial region in what would become known as the Battle of the Ruhr. Germany: During a test run at Auschwitz, it took 40 minutes to cremate 45 bodies. They instructed the prisoners operating the crematorium to increase the temperature. Russian Front - North: Day 544 of 872 of the Siege of Leningrad. Russian Front - North: Day 24 of 51 of the USSR's Operation POLAR STAR, a failed offensive north of Leningrad, hoping to take the southern shore of Lake Ladoga, Russia. Russian Front - North: Day 305 of 658 of the Siege of the Kholm Pocket, USSR lays siege to the Kholm Pocket but the Germans hold out for a about a year and a half. Russian Front - Center: Day 4 of 30 of the 3rd Battle of Rzhev-Sychevka, Russia. Russian Front - South: Day 15 of 25 of the 3rd Battle of Kharkov, Ukraine. MTO - Tunisia: Day 109 of 178 of the Battle of Tunisia. RAF and US Air Forces provide Allied air support. PTO - Alaska: Day 272 of 435 of the Battle of Kiska, Aleutian Islands. PTO: US 5th Air Force attacks targets in New Guinea and the Dutch East Indies. CBI - Burma: Day 75 of 104 of the 1st Battle of Arakan. US 10th Air Force provides air support. CBI - Burma: Day 26 of 79 of the Allied Operation LONGCLOTH. CBI - China: Day 2,068 of 2,987 of the 2nd Sino-Japanese War. The US 14th Air Force is established in China. ETO: Lt Gen Carl Spaatz accepts the conclusions of a study by economists of the EOU (Enemy Objectives Unit) and issues the "Oil Plan" to vigorously attack German oil production and distribution. Not only did Spaatz feel that Germany could be run out of gas, he felt the Oil Plan would be crucial to the success of the upcoming OPERATION OVERLORD by forcing the Luftwaffe away from the invasion area of Normandy to defend German oil production in the east. ETO - France: Leon Degrelle, leader of the Belgian fascists and commander of the Belgian Waffen SS Legion in Russia, visits Paris in an effort to shore up morale among his French counterparts. ETO - France: US 8th Air Force: B-24s attack airfields in France. ETO - France: US 9th Air Force: B-26s attack V-rocket bases near Saint-Omer-Abbeville, France. Germany: 732 Jews from the Westerbork transit camp arrive at Auschwitz-Birkenau. 477 of them are sent directly to the gas chambers without being registered into the camp. Prior to gassing the Czech Jews at Auschwitz, they are forced to sign postcards to say they are healthy and fine, which weren't mailed out until after the 25th. Russian Front - North: Day 33 of 191 of the Battle of the Narva Isthmus, Estonia. Both German and Soviet troops in the Baltic region go on the defensive. Russian Front - South: Day 73 of 113 of the USSR's Dnieper-Carpathian Offensive in southwestern Ukraine. Russian Front - South: Day 2 of 45 of the Battle of Chernovtsy, Ukraine. MTO - Italy: Day 49 of 123 of the Battle of Monte Cassino. RAF and US Air Forces provides air support for the Allied ground troops. MTO - Italy: Day 44 of 136 of the Battle of Anzio. RAF and US Air Forces provides air support for the Allied ground troops. CBI - Burma: Day 67 of 99 of the 2nd Battle of Arakan. CBI - Burma: Day 1 of 166 of the UK's Operation THURSDAY. US Paratroopers and UK Chindits are dropped behind Japanese lines to begin their BROADWAY operations in central Burma northeast of Indaw. One of the landing areas just happens to be full of Japanese Army lumberjacks, which causes several obvious problems. CBI - China: Day 2,434 of 2,987 of the 2nd Sino-Japanese War. US 14th Air Force attack targets in China. PTO: US 7th Air Force attack targets in the Marshall and Caroline Islands. PTO - New Guinea: Day 6 of 80 of the Battle of the Admiralty Islands. US 13th Air Force provides air support. PTO - New Guinea: Day 169 of 219 of the Battle of Shaggy Ridge. US 13th Air Force provides air support. PTO - New Guinea: Day 82 of 597 of the Battle of New Britain. US 10th Air Force provides air support. In northeast New Guinea, elements of the US 32nd Infantry Division land at Yaula. Australian ground troops break out of the Ramu Valley and retreat toward Madang. PTO - Solomon Islands: Day 126 of 295 of the Battle of the Bougainville Islands. US 13th Air Force provides air support. ETO - France: Day 217 of 284 of the Battle of Brittany. ETO - France: Day 172 of 236 of the Siege of Dunkirk. ETO: Day 45 of 66 of the Battle to the Rhine. Advance patrols of the US 1st Army reach Cologne. US 9th Air Force provides air support. ETO - Germany: Day 14 of 36 consecutive RAF night raids on Berlin. ETO - Germany: US 8th Air Force B-24s and B-17s attack oil refineries in Germany. Germany: The Nazis begin conscripting 15 and 16 year old kids into the regular army. Russian Front - Finland: Day 172 of 223 of the Lapland War. Finland and Russia have joined forces to kick the Germans out of Finland's most northern province. Russian Front - Center: Day 142 of 206 of the Battle of the Courland Pocket in Latvia. Russian Front - Center: Day 40 of 75 of the Battle of Königsberg, East Prussia (now Kaliningrad, Russia). The fortress city of Graudenz on the Vistula surrenders to the 2nd Belorussian Front. Russian Front - Center: Day 39 of 63 of the Battle of the Heiligenbeil Pocket in East Prussia. Russian Front - Center: Day 24 of 54 of the Battle of East Pomerania, Germany. Soviet 19th Army reaches the Baltic coast, cutting off the Germans. Russian Front - Center: Day 21 of 83 of the German Siege of Breslau (today Wroclaw, Poland). Russian Front - Center: Day 2 of 15 of the Battle of Kolberg, Germany (today Kolobrzeg, Poland). MTO - Italy: RAF and US Air Forces provide air support for the Allied ground units. CBI: US 14th Air Force attacks ships off the coast of China and French Indochina. CBI - Burma: Day 46 of 61 of the Battles of Meiktila and Mandalay. The US 10th Air Force provides air support. CBI - Burma: Day 30 of 99 of the Battle of Pakokku and Irrawaddy River operations in central Burma. The US 10th Air Force provides air support. CBI - China: Day 2,799 of 2,987 of the 2nd Sino-Japanese War. PTO: USS SEA ROBIN tracks an escorted convoy of two cargo ships and sinks the gunboat MANYO MARU, cargo ship SHOYU MARU and cargo ship NAGARU MARU. PTO - Japan: Day 15 of 36 of the Battle of Iwo Jima. US 7th Air Force provides air support. PTO - New Guinea: Day 434 of 597 of the Battle of New Britain. US 10th Air Force provides air support. PTO - New Guinea: Day 318 of 481 of the Battle of Western New Guinea. US 10th Air Force provides air support. PTO - Philippines: Day 137 of 299 of the 2nd Battle of the Philippines, aka the Liberation of the Philippines or the Philippines Campaign. PTO - Philippines: Day 81 of 244 of the Battle of Luzon. 5th Air Force provides air support. 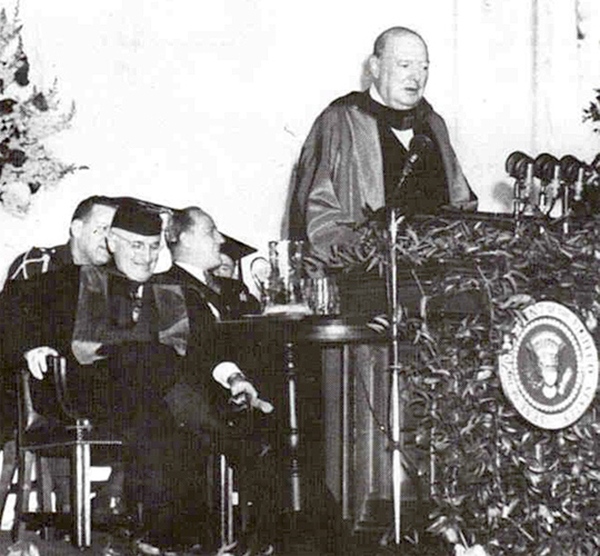 USA: Winston Churchill gives his famous "Iron Curtain" speech at Westminster College in Fulton, Missouri, warning, as he had a decade earlier, of a growing European menace, posed this time by the Soviet Union. Churchill's speech, entitled The Sinews of Peace, served to fundamentally define the dangers of Soviet totalitarian Communism. He issued a typically articulate and clear-minded assessment of the threat posed by the Soviet Union as well as a stern, historically-based warning of the perils that would arise should the threat be ignored. This speech made an incalculable impact upon public opinion in the United States and in Western Europe. Russian historians mark the beginning of the Cold War from the date of this speech. 01 Nov 36: "It's only fair. We had to have them in the last war." 20 Aug 40: "Never ... was so much owed by so many..."
A portrait of the irrepressible man who delivered the "Iron Curtain Speech" and fundamentally defined the dangers of Soviet totalitarian Communism. The controversial genius Wernher von Braun is a hero to most, yet a villain to others. Each of the 13 countries working on the development of radar believed that it was its own development and held the technology in highest secrecy.